“[We’ve been working to nail all of] that down. Because of what happened in the past, it was a more recovery-based offseason than upgrading our conditioning. A lot of time was spent evaluating that, coming up with standards, now that we have that opportunity. A lot of time was spent with our off ice issues. We had to face up to what happened there and it was the same thing. What could we have done to prevent this? More importantly, what is our approach here in the future to make sure this doesn’t happen again? Between that and what we’ve started with the templates and everything else, it has been pretty much nonstop. This is one thing; we’ve taken some hits this year. The one thing that I haven’t seen, nobody is pointing their fingers in the wrong direction. The whole goal here is everybody points the finger at themselves and let’s go from there. The players have, regardless of what they’ve been through; we never had any of that stuff when we were winning. That ‘I’m better than anybody else.’ We didn’t have any of this pointing the fingers when things fell out from under us this year. That is the one thing that has been consistent in terms of their approach. I’ve said this, but this season we were all struggling to find that certain ‘it,’ or whatever you want to call it, all year. “When it was over after Edmonton and Calgary, in reality we just got what we deserved. We have nobody to feel sorry for, whatever excuse, but how does it feel now? Every time we thought we were going to get out of it because we knew how to win or we had been in big games before, well that didn’t happen. But now we can learn from this. If you look at the cores of teams, if you believe a core, it is seven players. We’ve had a team whose core is in tact, has won two cups, won ten playoff rounds and their average age is 26.5. It is a marvelous opportunity for a lot of key players, secondary core guys who’ve won, to stick together and learn from this and make us better. If this had all happened and our core was averaging 34 years old or something, you’d go ‘Holy smoke wait a minute here.’ I think maybe having that success with so many young players might have been a product here. Handling success can be as difficult as handling failure. Let’s face it, we didn’t have it. We have a marvelous opportunity with this group to learn from it and make us stronger. Lombardi built it, Lombardi is the only one who can screw it up. He used to say,”We don’t have Yzerman to teach us how to win”. Well, Lindstrom came along and one more without Yzerman and Messier won two more without Gretzky although one of those was in New York. I hope DL “gets it.” It’s not Kopi or DD who is going to win the next one for him. It’s the guys who keep coming through the system. All this stuff about educating the players about drugs and domestic violence is relevant but not the key. DL has to learn he can’t hold the players hands even through the educational process. It’s about finding that next generation of players and riding them to the top again. TT, TP, DD, etc. are part of it but he hasn’t found the next guy yet to inherent the mantle from DB, JQ, Kopi, JW and JC. Keep beating the bushes, DL. Keep working it. Remember Scotty Bowman and he distance he kept from the players. Sam Pollard understood it too. Be the caring good guy you are but don’t let it affect your judgement. Stay objective!! I meant to say Sam Pollack not Pollard. My internet has been shutting down on this site frequently making it difficult to read over what I’ve written before posting. The point I was trying to make about DL and a possible dynasty is that’s only possible by him keeping a distance from the players. It may be, or not be, contrary to his personality but it is necessary. He’s going to have to keep turning the players over if he wants to keep winning Cups. Amen Crown Royal. Dean seems to think he can keep asking more of the same guys, keeping milking the same cows harder and getting more milk from them every year, while the rest of the teams get better. He doesn’t anticipate a big move? Well big moves happen every year in the NHL, they are available every year, and invariably, they help at least one team, if not multiple. So no good GM should ever see he doesn’t anticipate a big move. Big, hugely beneficial moves are always out there, and you should always be the one to get them if possible. Dean seems to think the team won’t need much of an improvement so long as the players he already has improved, but then why is he GM if he’s not going to improve the team himself, but rather put all the responsibility on improving the team on the players shoulders? You should never have the arrogant attitude that your roster is already good enough and doesn’t need upgrading, because you can always get better, but apparently that’s what Dean believes! The truth is, as you alluded to, Dean has become so emotionally involved with his players that’s he come up with this arbitrary number of 7 for the “core” of the team in order to avoid having to trade any of his “family.” So long as the team already has 7 good players, according to Dean, he doesn’t need to make any big additions. 7 is all you need. This way, all the guys Dean has gotten way too involved with, mixing business with his personal life, will get to stay Kings. Guys, remember the days when every time training camp came around, there would be surprise standouts in camp that would make the team? You always knew you were in for a surprise. Remember when Wayne Simmonds and Alec Martinez made the team out of nowhere, and how good Simmonds played? Or remember how Dwight King, Jordan Nolan, and Slava Voynov all came up at the trade deadline and played fantastic, at least for one season? Not so much anymore for the first two, at least not like before. Well savor those memories because none of that is ever going to happen again with Dean as GM, ever. Now that he’s won a Cup with the current veteran players and fallen absolutely in love with all of their minor quirks and started finishing all their sentences for them, guys like Colin Miller, Jordan Weal, Michael Mersch, and Jeff O’Neill, who are all better than at least one current Kings player at their respective positions, will never get a chance. Neither will any surprise player either. Hell, Dean was in love with all his gritty vets long before the Cup. He wouldn’t even give Bud Holloway or Oscar Moller a chance. Remember Nikolai Prokhorkin? KHL All-Star? Dean wouldn’t even give him a roster spot. Boy could we have used that scoring and playmaking last year eh! Dean is not objective anymore. He is in love with the grittiest and best led team of character that ever was, and not a single one of them can be moved, no matter the return. Even Colin Fraser had to play himself below AHL quality hockey ability before Dean would waive him from the NHL. It’s Dean’s great weakness as a GM, well that and drafting, and it cost the Kings last season, as it may cost the Kings next season. Yeah, though the loyalty thing is admirable it can also be self defeating. If Leiweke hadn’t pressured DL to fire TM he would most likely have lost his job instead of winning two Cups. DL was trying to blame the players rather than a coach who was not good enough to win a Stanley Cup until Leiweke forced his hand. It’s also Sutter who has an outdated concept of integrating players into the team. The Cap has changed the NHL. Sutter needs to get that but is stubborn. I think people like Mike Futa have a more realistic notion of how things now work. 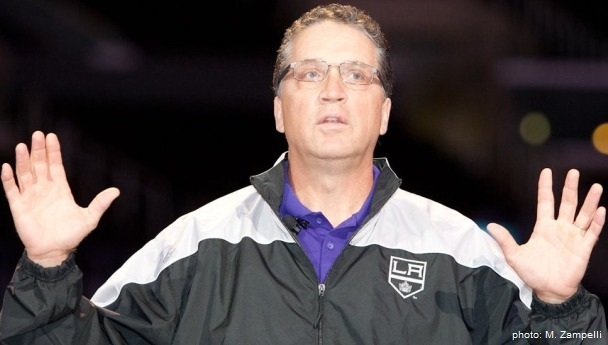 I do think DL and the Kings are doing a better job of drafting now than when he first started. Player development has also gotten way better. DL has a job to do which does not include being friends with the players and viewing them as his children. They’re making millions of dollars now and have a legitimate shot at winning Cups so that needs to be enough. Hoping DL wakes up and also forces DS to let the young guys play. It’s what’s best for the team and what’s best for us fans!